Der WZ-111 Modell 5A ist ein chinesischer schwerer Panzer der Stufe 10. Ein Prototyp eines schweren Panzers, der in den frühen 1960ern entwickelt wurde. Das Projekt 111 basierte auf den Entwürfen der sowjetischen Panzer IS-2 und IS-3 und sollte dem T-10 ähneln. Unter allen Varianten des 111 besaß dieses Fahrzeug eine verstärkte Frontpanzerung. Die Entwicklung wurde 1964 aufgegeben. 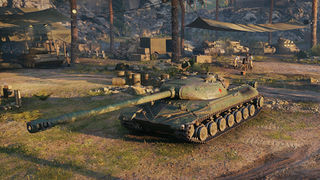 The Very first Chinese exclusive tank from Chinese server which were added to Live servers as alternate choice of Tier 10 tanks in Chinese HT line. Compared to 113, It offers more reliable protection and better gun handling in exchange with lowered HP, lack of angling ability and worsened accuracy. Der WZ-111 Modell 5A markiert das Ende seiner Linie chinesischer schwerer Panzer. 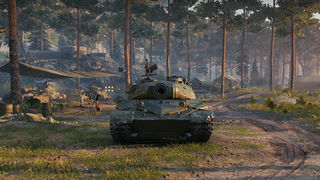 On October 19th,1960，the order to develop the WZ-111 heavy tank was given by the Committee for Science, Technology, and Industry for National Defense (国防科工委). The plan was revised by the Committee for Technology of Tanks (装甲兵技术部) on December 24th,1960. After that, the development of WZ-111 has begun. In March 1963, the plan was revised again by the Committee for Science, Technology, and Industry for National Defense (国防科工委). 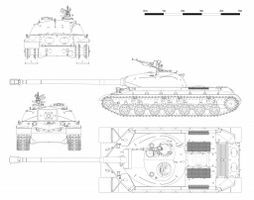 On June 10th 1964, final plans were made by University of Tank Technology(装甲兵工程学院). In 1965, one prototype (without turret) was created. Later in same year, the prototype of the gun and turret were made, but weren’t tested on the vehicle. After the prototypes were made, the testing of the vehicle was started immediately. The test mainly focused on the construction of the chassis and suspension in order to uncover issues of the design that weren’t anticipated by the designing engineers. After the test, the development was going to the next stage, but the research of main battle tank has already begun as well. Committee of Science, Technology, and Industry for National Defense thought that the development of new anti-tank weapon (smooth bore guns, APFSDS shells) made heavy tanks no longer important on modern battlefield. 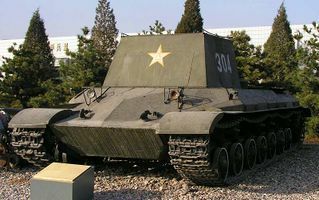 The development of WZ-111 was discontinued, but it became an important experience for Chinese designers and some elements of the design were used on other tanks later. The main gun on WZ-111 is the 122mm gun Y174. It is based on a field gun (Type 60? ), but it is hard to find any detailed information about this gun. But according to the 《ＷＺ１１１重型坦克设计技术任务书》 document, the fire power of the gun should be the same as the Soviet M62 tank gun. In addition, the gun has advanced hydraulic gun stabilizer, an autoloader (链式输弹机) (SS: from the google translation, I think it’s more like a hydraulic rammer, eg. not a real casette autoloader), an active illumination night vision observation device with electric rangefinder and an aiming system, that allows to hit the target at 1 kilometer accurately. Despite the fact the WZ-111 is a heavy tank, the mobility of the tank is still very good. The engine of the tank is a Chinese locally developed supercharged engine based on the Soviet V-54. It produces 750 hp, making it the best tank engine in China in early 1960s. The hp/t ratio of the tank is higher than that of Type 59 and Type 69, even just slightly lower than the one of Type 88 MBT. Later, the engine became the basis of WZ-122 and 68G experimental tank’s 650hp engine. In order to allow the tank to move on bad roads, the suspension of the tank is wide in order to reduce the ground pressure. As a result, the ground pressure of WZ-111 is very low, only 75.1 Kpa, lower than Type 59’s 79.6Kpa and Type 69’s 80.2Kpa, nearly same as the ground pressure light tanks usually have. As for the size, the WZ-111 isn’t very big, it can easily move in difficult terrain just like a medium tank. I did n’t translate this part because you already know how’s the armor design of the tank. The thickness of the frontal lower plate is 130mm, but not well angled and it’s interesting that WZ-111 also has NBC protection and a landmine detector (but it is not very effective according to the author of the Chinese text). 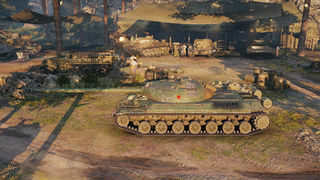 It’s evident that there are differences between the WZ-111 1-4 in WOT and the historical WZ-111 project. 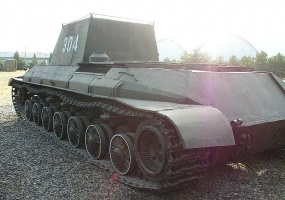 The historical WZ-111 had a 122mm instead of the 130mm tank gun. It had better engine and was slightlyheavier. It had an autoloader and better optics as well. WZ-111 in WOT might be the tested prototype of WZ-111 produced in 1960s and the proposed further development plan which was designed with a 130mm gun. Armament: the Y174 122mm and turret wasn’t finished when the vehicle was built (later the turret and gun were made and tested but unfortunately, there is no test result nor photos preserved) and since the 122mm Y174’s development progress was slow, a 130mm gun was also planned. Or mabe the 122mm Y174 wasn’t as good as PLA expected? WZ-111 hydraulic control system and gas emission system. Diese Seite wurde zuletzt am 7. August 2018 um 08:38 Uhr geändert.